The strongest solar flare in nearly two months erupted from the sun Tuesday, causing a minor geomagnetic storm as charged particles from the sun passed by the planet. The sun unleashed the moderate M2.8-class solar flare at 9:48 p.m. EDT (0148 GMT on Oct. 9). NASA's Solar Dynamics Observatory (SDO) recorded a video of the October solar flare's dramatic genesis. M-class solar flares are generally considered to be mid-range solar storms, but Tuesday's eruption was still the strongest in months due to the sun's oddly quiet activity. X-class flares are the most powerful type of solar storm, with C-class flares classified as solar tempests at a step below M-class events. Yesterday's solar flare was not aimed directly at Earth, but it did cause a minor geomagnetic storm yesterday. The storm has since subsided, but another wave of geomagnetic activity could follow, according to forecasters at the Space Weather Prediction Center, a division of the National Oceanic and Atmospheric Administration (NOAA). "The G1 (Minor) Geomagnetic Storm of the early hours on October 9 has weakened, and now forecasters await another shock in the next few hours," officials at the Space Weather Prediction Center wrote in an update yesterday. Geomagnetic storms occur when solar particles interact with Earth's magnetic field. Powerful solar flares aimed directly at Earth can sometimes cause significant disruptions to satellites in space, and can knock out power grids and communications infrastructure on the ground. 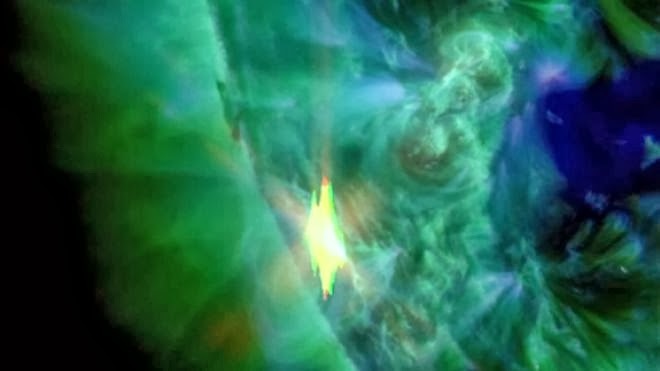 Tuesday's M-class flare erupted from a sunspot region called AR1865, which will be turning to face Earth over the next few days, according to Spaceweather.com. Sunspots are temporary blemishes on the solar surface that are caused by intense magnetic activity. These structures sometimes erupt into flares and solar storms that blast streams of plasma and charged particles into space. A different region on the sun also appears to be waking up, according to the Space Weather Prediction Center. "That active region will be Earth-facing for the next 11 days or so, possibly fueling additional eruptions from an otherwise quiet sun," experts said in an update. Unlike many federal agencies, which are shuttered due to the ongoing government shutdown, the Space Weather Prediction Center operated by the National Oceanic and Atmospheric Administration continues to post updates on space weather events because of their potential impact to astronauts and satellites in space, and infratructure on the ground. Strong solar flares can also supercharge the Earth's auroras, causing magnificent northern lights displays. Astronomers closely monitor sunspots because they act as indicators of the sun's current status. Solar activity typically ebbs and flows on an 11-year cycle. The sun is currently in the midst of Solar Cycle 24, and scientists had predicted solar activity would ramp up this year toward the solar maximum. Until now, however, the sun has remained strangely calm.